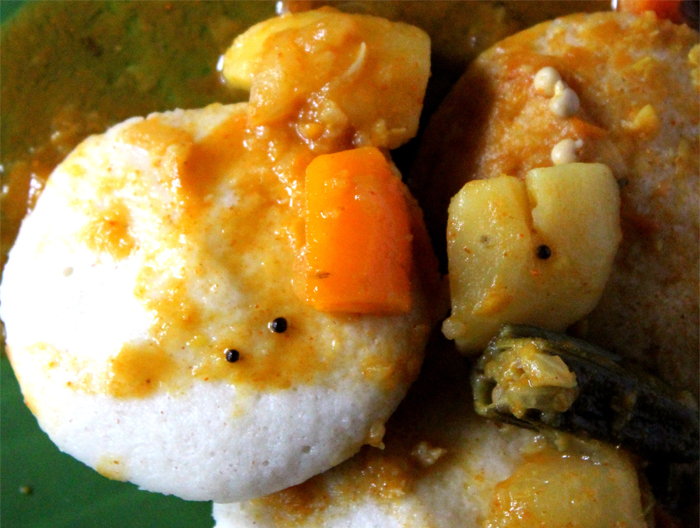 Idlis is traditionally a wonderful south Indian breakfast. When they are served with Sambar and Chutney, they make a full meal and can be enjoyed at any time of the day! Idlis are steamed food making them very healthy and very light. Making Iddli is a process that takes a couple of days, but at the end of it, it’s absolutely worth the effort! Wash the black gram Dhal until the water runs clear and then add the Fenugreek seeds and additional water and soak for 4-6 hours together. Drain the water from the Dhal and grind it with about one cup of water to a smooth consistency. Soak Ponni rice separately for four hours. Wash and grind the gram Dhal, Fenugreek and rice separately. Add one tea spoon of salt or to taste. Mix and whip up the batter with your hands until everything is blended well. Cover and allow the batter to ferment in a warm place overnight or about 8-12 hours until it ferments. Once the batter has fermented, it will rise. Mix well and add in water, slowly, till the batter is of dropping consistency. Check salt (add if needed). Add some oil to the idli stand. Spoon a ladle full of batter into the Idli stand. Stack up the idli plates in alternates, avoid one directly over the other giving the idli space to rise. In a stock-pot or a pressure cooker, add about an inch of water and allow it to come to a boil. Place the Idli stand in the boiling water and close. Make sure there is a vent for the steam to escape. Once the cover is closed, set timer for fifteen minutes. After fifteen minutes, take out the stand and spoon out the Iddlis from the iddli plates. Serve them with Sambar and Coconut Chutney. Store the Idlis in an insulated box until ready to serve. This entry was added on February 21st, 2013 by Reeja MytheenKunju in Breakfasts and Dinners and tagged with southindian idli, kerala idli recipe, breakfast, iddli, kerala food recipe, south indian iddli recipe, rice food, idly recipe, iddlie recipe. Last revised on April 4th, 2018. Recipe & photo contributed by Saumya S.
Cool recipe. I am from punjab and this was my first experiment with a south Indian recipe. I really loved it and will try all other recipes in your site. …Cheers…. Hi Shobha, Its not ponni rice. Its raw rice (commonly called pachari in kerala).